Buy a converter box. You can even get a rebate from the gov’t. If you must buy a new TV, keep in mind that of the new options, LCD is preferable to the environment over Plasma screens. Plasmas use so much energy that new energy standards being considered in Europe may effectively ban plasma screens. In fact, I read that a plug in car uses less energy than a new plasma tv. Slate has a great article about tv technology. It turns out that my old CRT (the old fat tvs) might use as much energy as a plasma. Yikes! Still, it’s best to let it die than to contribute to the new-product-production by buying a new one. When I do, I’ll get an LCD screen. Home Depot announced that all of their stores will have a collection point for compact fluorescent light bulbs (CFLs). This is great news for those of us who have made the switch to CFLs to cut down on our carbon output, and our electric bills! CFLs contain a small bit of mercury, which poses a problem when the bulbs are improperly disposed of. So, take your used CFLs to Home Depot when they burn out (in about 7 years) so they can be recycled. If you want to tour the Metro building, you can pick up a shuttle at the Metro RTA Park-and-Ride lot at 530 Ghent Road, or you can park along the path and walk. The building is located on the corner of Sand Run and Revere Road. The cost of the environmentally sustainable features cost an extra 15%, but that will be recouped by energy savings throughout the year, as the building won’t have to pay for their energy use. Most of that extra cost is also paid for through grants and donations. It really makes a lot of sense for public buildings (including college and university) to become more environmentally sustainable. Earth University was founded to reinforce the tenet of triple bottom line – community, environment, profit. They’re growing bananas organically, paying workers above minimum wage, and making paper from waste! The Oregon Wind turbine is compact and designed for urban and rural areas. It has less noise and vibration, and birds view it as a solid object, so they avoid it. These turbines can be linked, stacked, or mounted on a building in clumps to form a “wind forest.” They hope to have these available in 2008 for less than $1,000! Cities could even use these to generate power at the top of LED streetlamps! Don’t forget about solar. The price of solar panels is expected to plummet! Nothing but good news today. The Akron Aeros are encouraging fans to recycle this season! You can recycle aluminum cans and plastic bottles at the Canal Park Stadium, in partnership with Summit Akron Solid Waste Management Authority (SASWMA), the city of Akron and the Portage County Solid Waste Management District. Many sports teams are taking the lead on reducing our impact on the planet. Stadiums across the country have added solar panels to provide power to themselves and the surrounding community. Next time you’re at a game, check out what efforts have been taken to be environmentally responsible. Disclaimer: this post is for people who don’t want to buy gas anymore. Visit Instructables.com for detailed how-to’s on converting your diesel car to biodiesel. Diesel cars are more efficient than conventional gas to begin with. Unfortunately, they’re rare and hard to find. Check cars.com and craigslist.org for a listing of cars in your area. The good news is that VW will begin selling diesel Jettas and Rabbits (or Golfs) in the US soon. 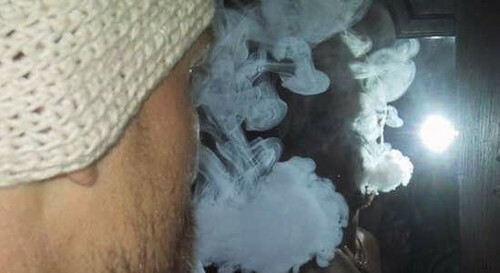 So, find yourself a diesel car, and check out these fantastic how-to’s. Convert your car to biodiesel. Yes, a small conversion is necessary. Vegetable oil will harden in the cold, so you can add elements to run the car on diesel until it warms up and then switch to the vegetable oil, or warm the veggie oil tank so it stays in liquid form. Make your own biodiesel processor. A small amount of processing is necessary – simply to remove food particles from the used vegetable oil. For the time and energy used, it’s well worth it. Finally, how to make your own biodiesel. Easy as pie. No more gas!! If you do any of these things, please keep us posted. It just makes so much sense to reuse vegetable oil and run your car with it. Diesel engines were invented to run on vegetable oil. These are so awesome! Rooftop wind turbines would make clean energy affordable for homeowners. The production grant from the government wasn’t that much money. I can’t wait to see this get moving! Click the picture to start the rooftop wind turbine video. 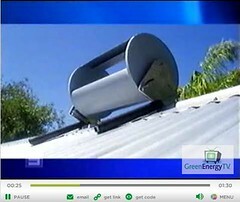 Check out GreenEnergyTV for other great technology videos. I drive to work about 20 times per month, which costs $40 in the Suzuki, and about $8 in the Buddy. A monthly bus pass costs $50 – for endless miles around Akron! What’s your families’ car math? I was fortunate enough to be included on a lunchtime conference call with Senator Sherrod Brown, who was announcing his new comprehensive energy bill. Senator Brown has participated in a series of “green” energy roundtables across Ohio. Anyone in Ohio knows that we have the potential to utilize our manufacturing base, and our educated workforce to create renewable energy. We can be the “Silicon Valley of Alternative Energy.” I’ve summarized his speech, and his answers to the press questions below. Senator Brown introduced the Green Energy Production Act as a jobs bill, an energy bill, and an environment bill. Its purpose is to turn research into products, and put people to work in production of renewable energy technology. Our economic future depends on our ability to move to renewable alternative energy. If we take this step, we’ll attain the global leadership that America is accustomed to. This will would utilize the potential of this state, and other manufacturing states to expand businesses like solar & wind entrepreneurs. While we’re debating whether to punch more holes in the ground, the rest of the world is passing us by. This bill would encourage the commercialization of renewable products. There are too many great ideas left on drawing board or produced overseas because America hasn’t invested in renewable technology yet. Ohio would benefit from this because we have the potential. Our green energy manufacturing future should build on our manufacturing past. The bill creates a Green Markets Program, and a Green Redevelopment Opportunity and Workforce program. It seeks to explore as many ideas and inventions as possible, and to encourage internships and apprecticeships to help our students learn the critical skills to meet the demand of the renewable energy future. There is an efficiency grant program which would match energy companies dollar for dollar to develop renewable energy and to encourage energy savings. Currently, coal-based energy companies have an incentive to misinform the public about the benefits of solar and wind. This bill would help energy companies develop clean technology, so they don’t go bankrupt, but they can do the right thing for the environment. Senator Brown said we need to build green energy here. It’s inevitable. Importing renewable energy technology like we do oil doesn’t need to be inevitable. It’s not in our country’s best interest. Essentially, this bill will create good-paying jobs here at home. Funding… over 5 years. This is a $36 billion bill, which incorporates a gradual increase ($1 billion the first year, $5 the next, and then $10 billion the following 3 years). It will make grants & proposals available. Some money comes from climate change legislation, which may include carbon credits. We currently give oil companies $18 billion in subsidies per year. Perhaps some of that money could be used to fund the bill that creates jobs here in America and makes us energy independent. That idea would make it hard to gain the support of some Republicans, because they like to call the removal of oil subsidies a tax hike. Oil companies are the most profitable they’ve every been, and are more profitable than any other American company. We also spend billions of dollars in Iraq. The bill creates an “investment corporation” to take it out of political process. There will be 7 members on the board, appointed by the president, confirmed by senate. Eligibility is based on criteria in the bill, which emphasizes business, labor, environment, and manufacturing. Senator Brown doesn’t support the Lieberman-Warner climate change bill, and he doesn’t think it will pass. (I honestly don’t know much about the bill b/c I’m out of politics, much to my delight) Brown’s Green Energy Production Act is not an amendment to a climate change bill. This bill stands alone. Is clean coal or nuclear included? No. This is about solar, wind, fuel cells and other new tech. “Clean coal” and nuclear power are not called “green” energy by most because of their harmful byproducts. They are not renewable sources. Ethanol is not specifically mentioned in this legislation. As we look at food prices, Brown said, more technology will be developed to create energy from renewables other than food, such as restaurant waste. What are the chances of it passing in this cycle? This bill is so different and innovative that it will take a long time to pass, so he is entering it into the public debate this week. It has potential. There are two other energy bills left to be debated this term. This bill gives me a little hope that, if we can get something like this started, we can swing ourselves out of the recession. We need green jobs, green manufacturing, and renewable energy that is inexpensive for the consumer. We can achieve this by producing the technology here at home. It’s the responsible thing to do. While we certainly don’t need to be wasting any more water, here is a cool invention that I’ve recently stumbled upon… a water clock. This clock runs strictly on water. No batteries or electricity needed. The water lasts months. Just add a little bit of water, and you will have a clock, thermostat, countdown, and alarm! It’s possible that the earliest water clock was made in China around 4000BC. They were mostly used for “astronomical and astrological reasons.” They functioned in coordination with sundials. Clocks weren’t essential until the Industrial Revolution, when people had to keep track of their time for wages. Through the centuries, water clocks were used for timing lawyer’s speeches during a trial, labors of prostitutes, night watches of guards, sermons and Masses in church, to name only a few. I guess you learn something new every day. On Tuesday (Earth Day) this week I witnessed an amazing occurrence where I teach. The students, faculty, and staff at Archbishop Hoban High turned off their lights! The students in our environmental science classes have been working hard these past two years beefing up our aluminum can recycling, paper recycling and now raising awareness of our energy use (dare I say “waste?!”). In conjunction with the Lights Out Akron campaign, http://www.lightsoutakron.org/, the environmental science students (along with their intrepid teacher Mrs. Mohan) proposed that the school not only turn off unnecessary lights during the 8-9AM hour suggested by the Lights Out Akron campaign, but for the entire day. Teachers and staff were encouraged to open window blinds and turn off the lights they didn’t need for the day. The best part was that everyone participated! As I walked the halls this morning with a local print news reporter, I saw EVERY classroom with the lights off or dimmed—no exceptions! The main office, athletic office, guidance office, business office, and institutional advancement had their lights off or dimmed too! I was extremely impressed at how willing our staff and students were to do without the normal lights to simply raise awareness of energy use. It seems we are entering a time of increased understanding of the importance of conservation and young people seem to be willing to change. When a teenager pays $3.50 for a gallon of gasoline, they immediately realize conservation is important for their wallet. When a teenager sees everyone in their school acknowledging the importance of energy conservation, they just might turn off the lights the next time they leave their bedroom at home. On a more personal note: The students’ goal was a simple one: raise awareness of how much energy we use unnecessarily. I for one try to do my part by recycling at home, driving a fuel efficient car, bicycling to work on nice days, and adjusting my thermostat appropriately, but I’m not very good with my lights. Oh I have CFLs in virtually every fixture, but I still turn on the lights by habit when I walk into a room and leave them on too much when I leave. I do the same thing when I teach. Tuesday was different. I, and other teachers, realized that if the window blinds are open we might not need all the overhead lights on. I got by most of the day with no lights at all and about one-third of the lights on later in the day as the Earth rotated and the sunlight changed. I learned a lesson on Tuesday, one I intend to use at work and at home. What did you learn on Earth Day this year? Congratulations to the Honors Complex for winning the aluminum can recycling contest. They were rewarded with a traveling trophy and an Earth flag. The three representatives took off to tour campus with their Earth Day pride! 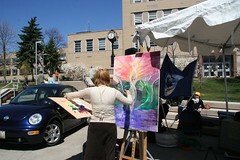 After DJ Zachariah, Rachel Roberts played acoustic guitar, while Ursula Rauh painted a picture along with the music. It was beautiful art by two wonderful artists, and certainly highlighted the solar stage for the afternoon. The solar stage was powered by the sun! Dovetail Solar and Wind set up a solar trailer and propped up the panels to take full advantage of the sun’s plentiful energy. They also brought a wind turbine for display. Dovetail has several projects across Ohio. “Green” jobs are American jobs – you can’t outsource solar panel installation. This is yet another great reason for the U.S. to get moving towards renewable energy. The UA campus police ride Segways around campus. They’re quick, and run on electricity. The wildest part is that they read your mind! If you think “go forward,” it goes forward. If you think “stop,” it stops! A noted skeptic, I had to try it, and it was true! How does it do that? Well, when humans think “forward,” we lean a little bit forward. The Segway takes advantage of that natural occurrance and motors us forward. It seems more practical for campuses, airports, etc. Not so practical for the average consumer, in my opinion. It was really fascinating, but I can’t see myself ever owning one. UA is trying to become a more bike-friendly campus. Students can look forward to more bike racks, and a bikers map of campus. The city of Akron is helping by also installing bike racks. It’s a hilly campus, but bikes are a great way to get around. There is a serious parking problem on campus that would be helped if students who live a mile or two away would ride a bike instead of driving to campus and parking in a parking garage for the week. This year’s Earth Day event was funded by Environmental Akron, a student club, and through the sale of salvaged metals. As the university is expanding and building, some buildings are being torn down. Fortunately, the Director of Materials Handling had the foresight to go into the buildings and salvage as many usable materials as he could. He and his team salvaged a lot of metal and other usable goods such as office furniture and equipment. The salvaged metal brought in enough money to pay for Earth Day, with much to spare. Good job Mike! Blog at WordPress.com. Theme: Rounded by Release.